Eugenia is an Eating Psychology and Emotional Eating Expert with a BSc in Business Psychology, Mindfulness and Nutrition Coach, Motivational Speaker and a Yoga Instructor. She majored in coaching and personal development specialising in NLP and CBT. Eugenia furthered her education through the Integrative Institute of Nutrition receiving a certificate in Holistic Nutrition and Health Coaching where she was trained in more than 100 dietary theories. Now Eugenia is using some of the most powerful tools when working with clients: NLP, CBT, Mindfulness and EFT. Before Eugenia started her private Nutrition Coaching Clinic, she worked in Change Management and Human Resources where she was, successfully, utilizing her psychology and coaching skills supporting employees towards growth and development in their jobs. Eugenia’s expertise has been featured in magazines such as Stuff.co.nz, NEXT and NZ Good Healthy Choices. She has been interviewed a few times on Radio Live talk on how to end the war with food and body image and the shame that comes with this. She has also been a guest blogger for AwesomeInc, Voices Of Hope, Seed + Soul, Consciously Living, and Pretty Pinz. Through her coaching and speaking, Eugenia enables people to discover the power of their mind to profoundly transform their eating, weight, body image and their enire quality of life. 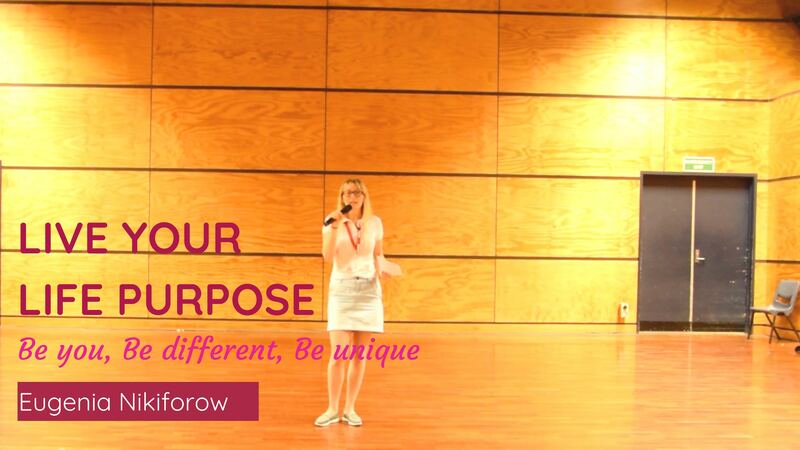 For Eugenia promoting mental and physical health through the most powerful tools including mindfulness, positive psychology, brain science, NLP and CBT is not just her profession, it is her passion, her purpose and her personal way of life. 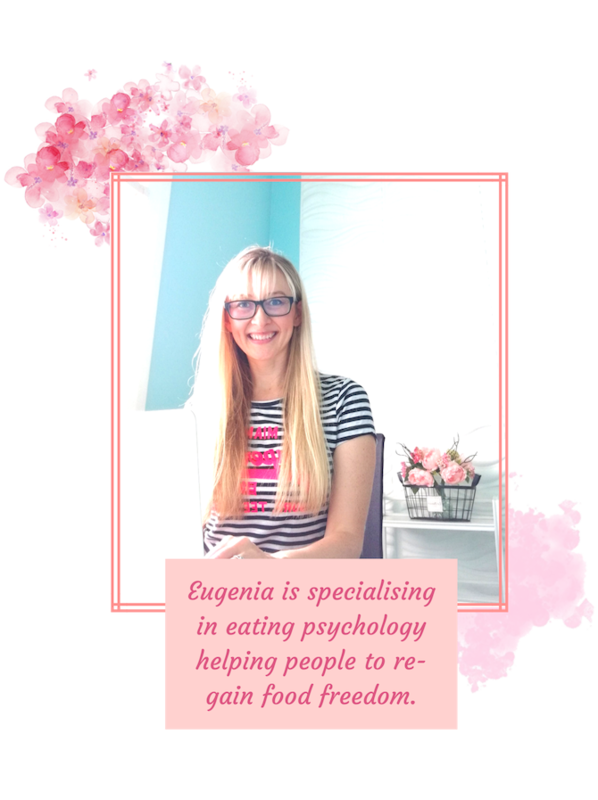 Eugenia’s passion comes from her own experience of many years of eating disorders, dieting, emotional eating and body hatred. She personally has experienced how our thoughts, emotions, and actions can dramatically improve our eating, weight, movement, our body image and the quality of our life. In fact, she believes it’s more powerful than medication. Her key message is for you to feed your spirit, not starve your body. Eugenia helps everyone who struggles with emotional eating, overeating, binge eating, food cravings, and yo-yo dieting. You can book a call to speak to Eugenia HERE. She offers support with mild eating disorders and other forms of disordered eating. She offers twice a year an online program helping people beating binge eating and overeating. You can register to get notified when the course is open. Eugenia shows people how to release excess body fat without resorting to diets, deprivation, denial or discipline. She speaks for events, corporate events, and private functions. Contact Eugenia HERE to discuss your inquiries. She teaching mindfulness and yoga classes. Find out more HERE. Learn to use mindfulness in your everyday life to improve the way you think, feel and act. Through her work Eugenia presents at seminars, schools, health clubs, events, corporate offices, and beyond. Her life experience and education combined with her burning passion to show the world that health does not have to be so hard empowers her audience with excitement and inspiration to get from where they are to where they want to be. Eugenia’s presentations are engaging, informative, and infused with so much love and passion that they’d make even the most cynical person get off the fence and take action. Eugenia’s story is relatable so she always connects with her audience at a deep level providing a safe space for them with love, compassion and empowerment. As a Certified Holistic Health and Nutrition Coach, Certified Yoga Teacher with Mindfulness Focus, Business Psychology Graduate, Personal Development addict, and experienced Speaker, her extensive knowledge and revolutionary methods towards creating a loving relationship with food and one’s body always hit the mark.